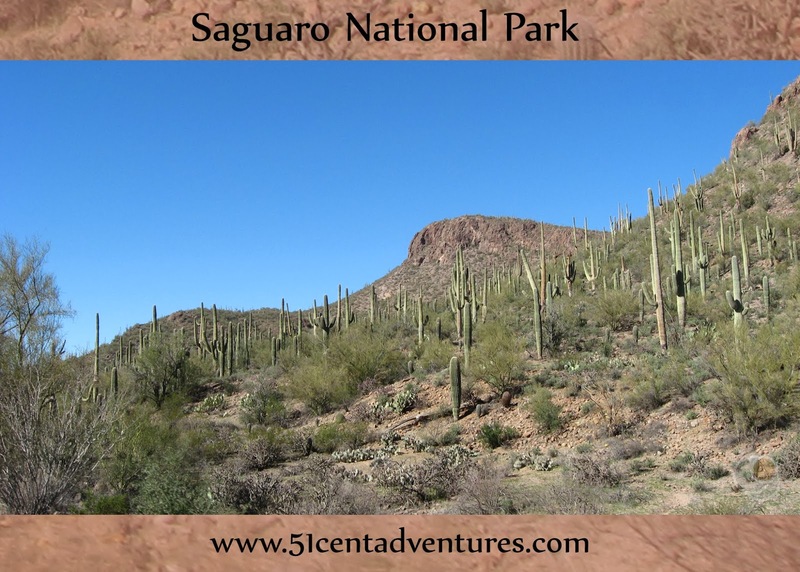 Saguaro National Park is a great place to see it's name sake plant. Operating Hours: Sunrise to Sunset for vehicles. You can walk or bike into the park 24 hours a day. Visitor Center hours are 9:00 to 5:00. Recommendation: A good place to see a lot of cacti. Definitely worth driving through. When I was a kid I loved the TV show Reading Rainbow. Every episode transported me to a new place and taught me new things. I watched that show faithfully every day. Even now, over 20 years later, I still remember some of those episodes in detail. 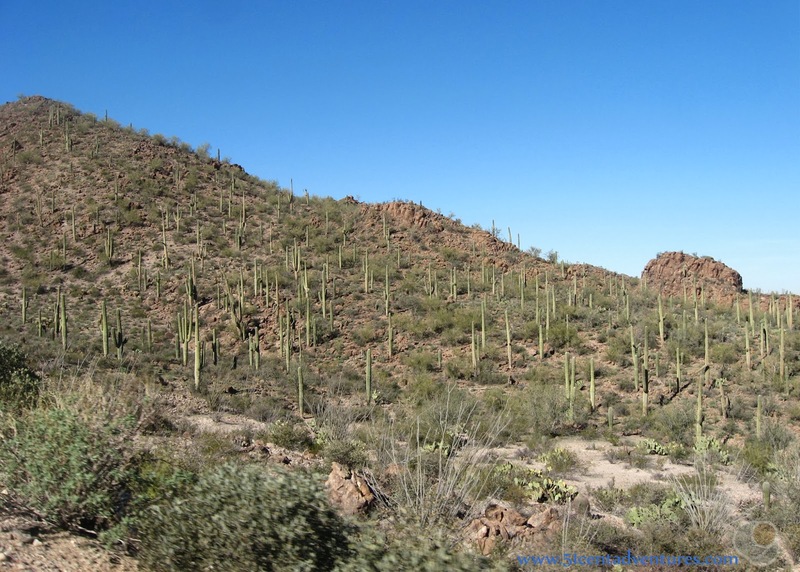 One of my favorite episodes was about the Saguaro Cactus Plants. I was really impressed by how one giant cactus could provide so much for the animals and people in the desert. I always wanted to see a Saguaro Cactus in person. That dream came true in 2007 when Brandon and I traveled to Arizona for his brother's wedding. We saw cactus plants along the sides of the highways and even in the front yards of homes. This year we traveled through Arizona again. We spent several days in Mesa before driving home to Texas. On our way through the Tucson area we noticed signs for Saguaro National Park. Brandon remembers Reading Rainbow as well as I do, and so he wanted to stop and see the Saguaros in their natural environment. At first I thought the park would be too far away from the freeway for us to take the time to stop. After I checked the map I discovered that the West side of the park was only about 2 miles from the freeway. So we decided to take a quick detour through the park. 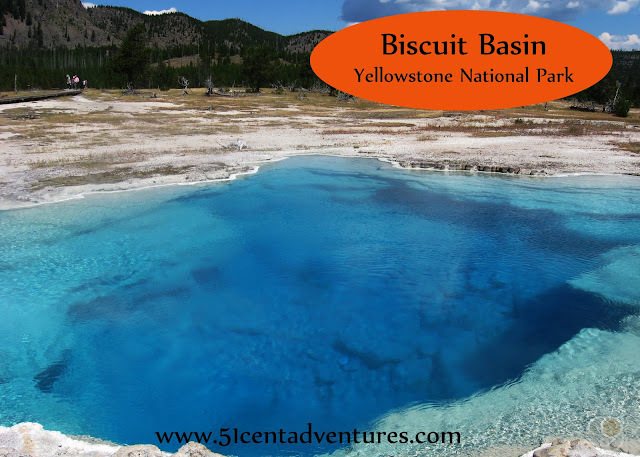 We have a National park pass, but we didn't need to show it because there wasn't an entrance station gate. We drove around a bit once we were in the park. 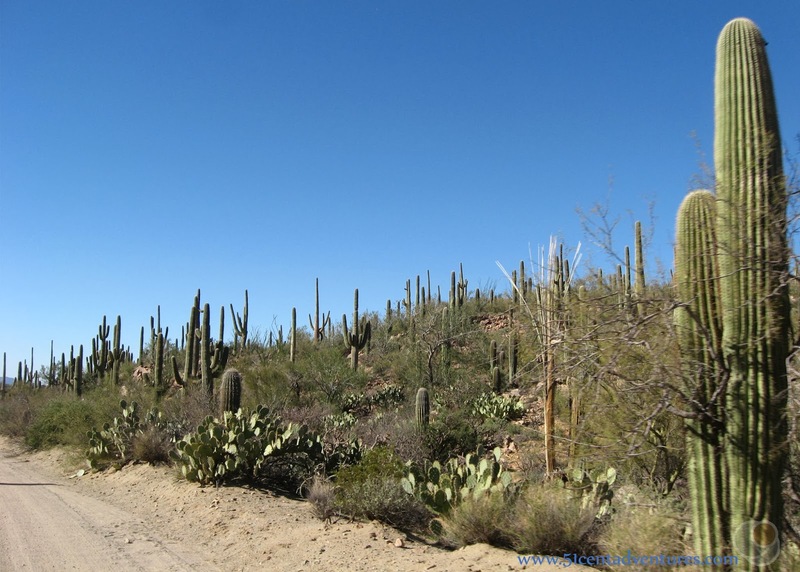 We even drove onto a dirt road so we could get a closer view of the cacti. We were tentatively planning to have lunch at the Visitor Center, but it was further away than we anticipated. We were pressed for time so we turned around and headed back to the interstate. Before we left the park we pulled over to the side of the road. We let our kids get out of the car so they could touch a cactus. 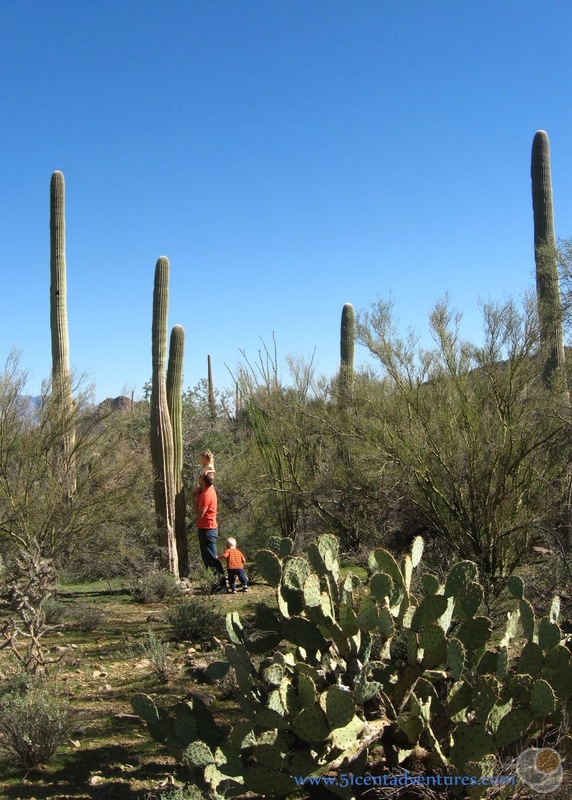 I wanted my kids to have a sense of the Saguaro's enormous size. My 3 month old daughter had been screaming for the last 5 minutes while we searched for a good place to pull over. She and I stayed in the car so she could nurse while Brandon took our son and one of our daughters over to a cactus. Our oldest daughter was sleeping so she missed out on the mini hike. I'm glad we took the time to see the Saguaros. The park has many trails and some campsites. Maybe one day, when our kids are older, we will come back and get a more in depth look at the park. I'd like to come back sometime in May or June to see the flowers bloom on top of the Saguaros. Directions - If you are travelling south on I-10 the signs will direct you to take exit 236 onto Sanderio Road. This is the most direct and quickest route to the visitor center. However, there is a shorter option if you just want to drive through the park and see some cacti. Take exit 246 onto Cortaro Road. Take a right onto Ina road and a left onto Wade road. Wade Road tuns into Picture Rocks road which goes through the park. It all sounds a little complicated, but in reality the park is barely 2 miles away from exit 246. If you have time, and a vehicle that can handle it, turn left onto Golden Gate Road. The road doesn't look like much. It's just a little dirt road. However, this road will grant you closer access to the cacti. There are also several picnic sites along the road. The dirt road meets back up with Sanderio Road. You can continue on to the visitor center if you like.